In 2011, at 24, Caitlyn Pyle was brutally fired from her job as a court reporter. The woman who fired her told her she was trash, that she would die alone, and that she felt sorry for her husband. Additionally, the woman extorted her for $2,000. The irony of the situation was that the woman who fired Caitlin was the one that had taught her how to proofread transcripts. At the time she was fired, she was making about $500 or so a month freelancing. She progressively built up her proofreading income to more than what she had been making in her office position. In November of 2014, ProofreadAnywhere.com was launched. ProofreadAnywhere.com is a blog where Caitlin wrote about her work as a proofreader. She then wrote a 30-page ebook that sold 15 copies the first month. Encouraged, she launched an online course. As of November 2017, Proofread Anywhere had generated more than $3.5 Million in revenue over 3 years. Caitlin’s blog has evolved into BCP Media, Inc. and now operates multiple content platforms, including Transcribe Anywhere and ScopeSchool.com, which are mostly geared toward the work-at-home niche. In April of 2017, at 30, Caitlin became a millionaire. She is preparing for the launch of her largest project to date, Work-At-Home School. 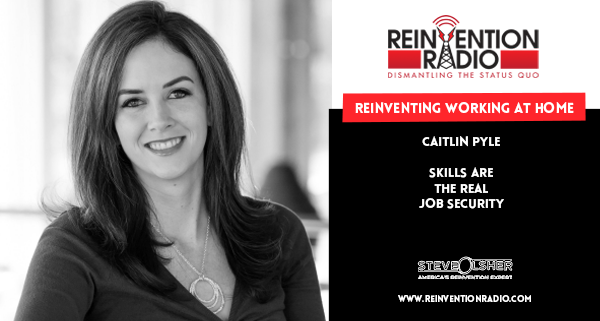 Tune in to hear Caitlin chat with Steve, Mary and Richard about her journey from unemployment to becoming a millionaire. Reinventing Abundance – In this episode, the Derek Rydall chats with Steve, Mary and Richard about his teachings on Emergence.